Discussion in 'Disney Cruise Line Forum' started by kmlb81, Mar 17, 2019. We are about to go on our second cruise and I am considering using a TA for our third. My question is- is it the best deal to book our cruise while onboard (either specific date or placeholder) and then transfer it to a TA? It seems most people do this? If you already have a TA do you just book all your cruises through them or do you take advantage of the onboard booking deals? Second question, if I don't have a TA I've used, can I just give Disney the name of the one I would like to use when I book on board? I have asked for quotes from two companies and I'm not clear on the logistics of getting my reservation switched to them. Is transferring it after the cruise just the way to go? My question is- is it the best deal to book our cruise while onboard (either specific date or placeholder) and then transfer it to a TA? It seems most people do this? If you already have a TA do you just book all your cruises through them or do you take advantage of the onboard booking deals? If you rebook onboard just give them the name of the TA. That handles it all. if I don't have a TA I've used, can I just give Disney the name of the one I would like to use when I book on board? Yes. For example, have them list Dreams Unlimited Travel (sponsor of these boards) as your TA when you book on board. If you find a TA later, you must transfer your reservation or placeholder within 30 days or it cant be transferred. To transfer a placeholder, must the specific voyage be booked within the 30 day window to preserve the 10% and OBC, or just request the transfer within 30 days? Just the transfer to the TA must be done before 30 days. We use Costco as our TA, and they allow you to transfer a DCL booking to them within 30 days. You get full onboard booking benefits from Disney, then on top of that, after the cruise you get a cash card from Costco worth 8.5% of the base cost of the cruise. Many Costco customer service departments will allow you to cash out the Costco cash card outright, which translates to big savings (18.5% in all) when it's combined with the 10% OBB discount. And if you're an executive member, at the end of the year you get a check for an additional 2% of the base cruise cost, which brings your total savings on the cruise to 20.5%. Thank you, I was stressing trying to figure out a booking! This is exactly what I plan to do. Thank you for breaking down the discounts, it really is a significant savings. I didn't realize that I might be able to cash out the Costco cash card. I just did that with my Costco Visa Rewards certificate. They converted it to a check in store. I'd use the cash card since we shop at Costco frequently, but I prefer the option to put it directly toward the cruise costs! Base fares as DCL. The total fare is the same but on my itinerary from Costco the taxes are higher than DCL had them. We just got home so I thought I would update. If you did not book your current cruise with a TA, you can not give them a name of a TA when booking your next cruise on board. The only way is to transfer it (within 30 days) after the cruise. They said they used to let people do this in the past but no longer do. So if you booked your current cruise with the TA you plan to use for your next, they will use it but if not you must transfer it afterwards. T & R More cowbell !!! We use Costco as our TA, and they allow you to transfer a DCL booking to them within 30 days. You can still pay with disney gift cards as I understand it, you'd have to call Costco who would then get DCL on the line in order to process your gift cards. You don't technically pay Costco anyway, even when making payments online on their website, the payment is processed by DCL. Costco takes Disney gift cards to pay for DCL cruises. Has to be done over the phone, however. It can't be done online. Keep in mind that most TA accept Disney payments. 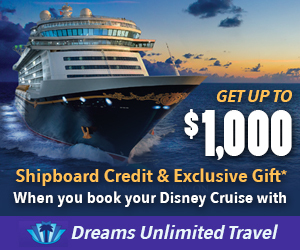 I use Dreams Unlimited and they accept Disney gift cards and Disney rewards. They are just the liaison for you. You give them the card info online or by phone and they apply it for you. My daughter uses Disney gift cards that she gets at target, combines them and forwards the info to DU.